Organic Coffee, Shade Grown Coffee, and Fair Trade Coffee - Why Buy? Many people start the day with a few cups of coffee, or if you're like our very energetic Aunt Speedy, a few POTS of coffee. You may have noticed that sometimes the coffee tastes better than others. That's because there is a great variety in quality among brands and styles, and usually even WITHIN brands and styles. Organic, shade-grown coffee is the really good stuff, my friends, and if you've never had a cup of it, you don't know how good coffee can be! And yes, we said "bird-friendly" above. Read on, my fine-feathered coffee fiends. Clear the native rainforest trees and undergrowth to make way for dense planting of coffee bushes. Get a sun-tolerant variety of coffee bush and plant it. Apply chemical fertilizers to keep up with the plants' faster growth and to make up for the loss of nutrients (because of soil erosion and because nitrogen-fixing trees and plants have been removed). Apply chemical pesticides to control insect pests, which were previously controlled by higher numbers of birds (which are now greatly diminished due to the less hospitable nature of the full-sun coffee farm). Chemicals contaminate the land, water, and farm workers. Habitat for songbirds—and many other species, including howler monkeys, iguanas, ocelots, peccaries, pumas, and tree frogs—is greatly reduced. The loss of the larger trees leads to soil erosion from the typically steep terrain, which lessens the land's fecundity and pollutes local waterways. The increased productivity associated with mass conversion of shaded coffee operations to full-sun operations floods the market with coffee beans, depressing prices and lowering quality. Many of the birds populating North America each summer spend their winters in "coffee country" in northern Latin America. 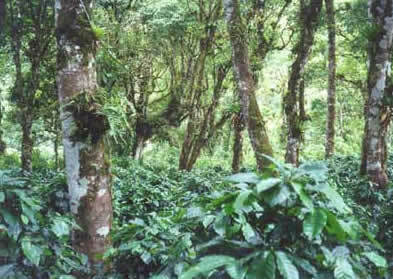 Traditional coffee plantations provide some of the last remaining forests of this region, providing essential habitat for the birds. Hummingbirds, swallows, warblers, orioles, tanagers, and other native and migratory birds find a safe haven in the remaining forests of shade-coffee plantations. Studies in Colombia and Mexico found 94%-97% fewer bird species in "sun grown" coffee plantations than in "shade grown" plantations. Most birds find food and shelter in the canopy of the shade-coffee plantations, while there is very little food and shelter in sun-grown coffee plantations. In spite of all this bad news, there is a growing worldwide movement to support and enhance systems for producing shade-grown coffee, from the farm to the bean buyers and processors, to the markets and coffee shops, and finally to your coffee cup. This helps birds and other critters, addresses local environmental and farm-worker issues, and ensures you the best-tasting beans. processed without the use of harsh chemicals. The agricultural techniques used to grow organic coffee need to work with the coffee plant's natural preferences and the advantages inherent in a healthy farm ecosystem. Thus, the approaches for organic coffee and shade-grown/bird-friendly coffee are mutually supportive, and the two characteristics are often found together in high-end retail coffee (which makes shopping a lot easier). Get more audio clips on food, organics, issues and many more topics in Grinning Planet's biweekly downloadable audio news feed. Because organic coffee plants feed nutrients more slowly and steadily to the beans, and because the native soil still retains its complex nutrient base (as compared to the depleted soils on full-sun coffee farms), organic coffee beans have a rich, smooth flavor. Organic coffee growers often get a higher price for their beans, partly because they're organic, but also because greater care is taken to remove the occasional bad bean from the lot. All this results in a great, non-bitter cup of coffee. When you sometimes pay $4.00 or more in a coffee shop for a single cup of coffee, you'd probably think coffee farmers are making a killing. But they aren't. Between the coffee grower and your pricey little cup o' joe are the middlemen—processors, roasters, exporters, creditors, commodity brokers, retailers, and others—who add to the cost. Coffee is traded as a commodity—just like oil, gold, or pork bellies—and is second only to oil in commodity value. Because of the production glut brought about by sun-grown coffee, the price of coffee has been chronically depressed on the world market, making it difficult for farmers to make a good living from year to year. Fair trade organizations work directly with cooperatives of small farmers to eliminate much of the middleman costs and provide the growers with a stable price that ensures a reasonable standard of living. For instance, in 2004 the UK Fairtrade market guaranteed participating coffee growers a minimum of 126 cents per pound for arabica coffee beans, compared to a world market price of 52 cents per pound. Many fair trade organizations also encourage their growers to employ sustainable farming practices (such as organic and shade-grown). Many coffee shops are now offering coffee that is shade-grown, fair-trade, and/or organic. If you don't see it listed on their menu, ask 'em! Almost all natural foods stores carry organic coffee, fair-trade coffee, and shade-grown coffee—and usually a few brands that have all three characteristics. Some mainstream supermarkets are beginning to carry such products as well. In general, is coffee bad for you? That depends on your body's individual tolerances, but in general, coffee is not bad for you. And in some ways, it may be good for you. Studies by Oxford, Vanderbilt, the American Medical Association, and others have concluded that coffee has some health benefits, including reduction in the risk of colorectal cancer, Parkinson's disease, kidney stones, gallstones, and cirrhosis of the liver. A 2001 Oxford study found that one cup of coffee has more anti-oxidants than one cup of green tea. It's worth noting, though, that some people have an allergic reaction to coffee or caffeine, with symptoms such as exaggerated stress, headache, nausea, and heart palpitations. So, listen to your body, and if your reactions suggest that coffee might be a problem, cut down on it or eliminate it for a while to see if things get better. If you're sure coffee doesn't have any downsides for you, bring on the java! You can also shop online. Here are two of our favorite brands that every morning help us communicate the following data to our brains: "Engage!" And finally, please share this article with a coffee-loving fiend. Er... friend. Thanks! Are Pesticide Residues Enough to Make You Buy Organic Cocoa?